I bought this for my 07 Ultra. Some friends and I are doing a 4-day road trip and I want to keep the Florida sun off of my seat. It stretches to stay in place. When I test fit it in the garage, it took a lot of stretching. It may loosen up, warmed up in the sun. But it will work for my trip. And I know it will work a lot better on my '92 Dyna. If you have anything below a full-blown touring bike, buy this is an instant. For full fairings, Electraglides, Gold Wings, etc. ... It will work, but it takes a bit to get it situated. BIG PLUS: This thing nearly packs in to the palm of your hand! Another option, bit much bigger: I'm looking at the Nelson-Rigg UV2000 1/2 Cover. I'll post a review over there if I decide to try one. Fantastic product! I love it. Great product! Florida sun wont ruin my seat. Easy to deploy and stow in the saddle bag. I'm buying them for gifts! I live in Arizona and need to shade from the sun. Works great! I'm afraid it will be stolen right away because I don't see a way to secure it but I really like it. Small price to pay to protect your $600 or more seat! Not much to say. It is a cover for the seat and it does exactly that. Seems to be a well made product. I attached a couple of plastic hooks to a couple of the bungees to make it easier to attach to the bike. Whole thing folds nicely into its own little pouch and does not take up a ton of room in your saddlebag. Fits my FXDL like a glove. The bunji cords are stretched to the limit due to my mini-ape bars and forward controls. How long the bunji's keep their stretch is yet to be seen. 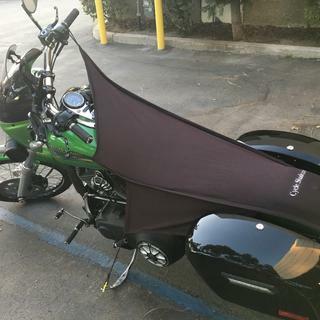 The cover keeps my tank and seat totally covered and shaded in 100º+ temps. So far, so good! Fits well on FLHTKL Ultra Classic Ltd. 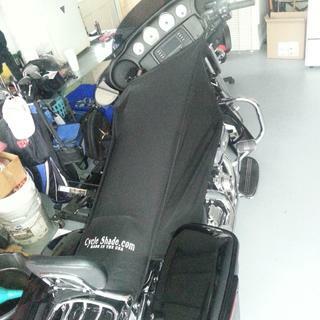 Fits very well and keeps seat from getting hot, it also covers the gas tank. I loop mine around the mirrors but you can loop the handlebar grips if you rather. It also loops the gear shift, the brake or highway bar and also the knobs to secure the saddle bags. Pretty well made but I know after a couple of years in the Florida sun the bungees will go bad. To keep the seat from getting blistering hot it is very worth it. Now i can go everywhere that I want without any worries. Works great for what it is; here in Florida it keeps the sun and bird crap off my bike. Love it!! I'm very happy with my new cycle shade. It goes on in 60 sec and keeps the tank and seat cool on those hot summer days. Ordering was easy and deliver quick. Fits great. Lets see how it fairs in California sun this season. Easy install. Gets a lot of looks. Keeps seat cool. It’s doing it job by keeping the sun off the seats. In Arizona we need all the shade we can get . The best product, easy to use. A must have for any saddlebag. nice to sit on a seat that's not boiling hot! I highly recommend this product. 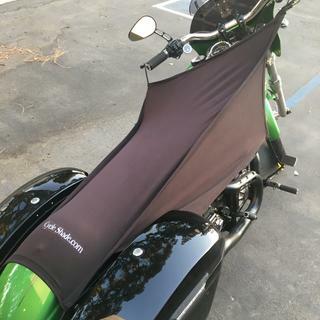 It fits my Dyna Wide Glide perfect, keeping my seat and tank cool in the northern California summer heat. This product will save you hundreds of dollars by extending seat life. Great product. Cycle shade is the way to go. I stand by real Cycle Shades. We make these for the seller, not Mr Kirk btw, but that being said, the original Cycle Shades,seller stands by his product. He has never had a problem after 8 years. It's polyester solid black they don't turn grey. This Must be a knock off. Will this work on a roadking with 16in apes? 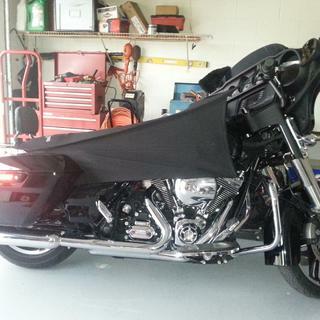 I use it on a Street Glide with 12 inch bars and it works great. 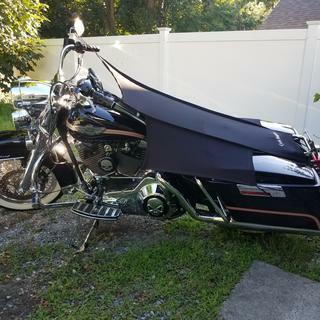 Will this cover fit a tri-glide? BEST ANSWER: I would think it would it fits my Ultra Classic Ltd., It covers the seat and gas tank. I loop mine over the mirrors and back to the luggage rack with no problem. It stretched quite a bit. You would have to put the rear hooks somewhere other than turn signals but should still cover most of the seat and tank. I don't see why it wouldn't. It fits my Ultra Limited, you have a few different places to hook it to. It should keep the tank and seat cool and covered, but not much else. Does the cover have Dennis Kirk logo?? BEST ANSWER: I don't believe so. I returned it due to the poor quality of it.